GROUND ZERO PLUS 1267 DAY--New York, NY, Sunday, March 2, 2005-In the bigger scope of things today, one doesn't think of a toilet as a potential Terrorist. Not, that is, until its contents overflows from the apartment above upon you and all your bathroom belongings. Last night I was aroused from a deep sleep by an incessant ringing of the doorbell. I knew it wasn't the police because they bang and yell. Struggling to get clothes on, I heard my wife asking who was there. "Toilet ... is ... okay?? Is ... not okay??" The building Super limped and huffed into our hallway. He's far too old to be tromping up fifty nine stairs--the elevation to our fifth-floor apartment--especially at nearly 2 a.m.
Joseph is Ukrainian. Where we live in the East Village, the street is mostly Ukrainian rooted. Things have changed over the years, but the "old school" still has a firm grip on the block. Just a block west of us is a huge Ukrainian church. Across the street are Ukrainian travel agencies, and around the corner a Ukrainian butcher and several Ukrainian restaurants..
Josef took one look at the raining water sieving down from above into our bathroom. Just two days earlier he had fixed the ceiling from a previous leak more than a year, or was it two, earlier? Time slips by flush by flush. "It go three floors....aiyyyy...yieeee...yieee..." And out the door hobbled Josef with his flashlight. Now, I have this aversion to toilet water dripping down over everything you own in the bathroom. You just don't know what it contains. In a New York building aching because its more than 100 years old, you just don't expect the plumbing to be that modern, and, you tolerate the fact that like the United States, there may not be a lot of funds to retrofit the infrastructure. Thus, when something goes awry, there's a chance the whole building could collapse. Three years ago our daughter's apartment building was threatened with extinction. Butted next to another building that contained artifacts such as marble statues, the owner of the building decided to remodel it without seeking building permits. Seems he was knocking down a wall without reinforcing the beams, and, because of the weight of his statues, the whole building began to crumble. Most construction in the East Village doesn't exceed five stories because the structures were made out of brick. Brick can only safely handle about five stories. Only when steel was introduced could buildings soar toward the underbelly of the sky. Bricks had limitations. My daughter's apartment was brick. So was the one that crumbled. There were a few days when inspectors poured over the buildings next to the crumbled one to see if, because everything was so close and seemed to lean on every other building, there was any major structural damage. She moved back in, only this time with a little more of a view because the building behind her wasn't there any more. So when a toilet leaks and water showers down, if you're schooled in New York City Village life, you don't jump up and scream. It's part of life. But that doesn't make it less Terrorizing. In Israel, suicide bombers are part of life but that doesn't make one leap with joy when a bomb goes off. In Baghdad shooting judges and lawyers defending Saddam Hussein seems to be as common as picking one's teeth with the pin of a hand grenade, but again, there isn't dancing in the streets over such a death unless you're on the side of the "bad guy." It can be said, then, that last night, half naked, drowzy, afflicted by hay fever, I stood a bit dazed looking at the torrential flow of toilet water from the toilet above. What do you do in such a crisis? You think smart. I did. I got out the umbrellas. I put them over the toilet and set up a defense so all the toilet products one buys and stores on shelves wouldn't get ruined. That includes the shavers and curling irons and hair dryers and other electrical items. I snagged the towels to safety, thinking of uccky toilet water from some unknown source and mixed with unknown germs, dropping on the cloth one dries one's sacred flesh with, and the idea of the unknown made my pores pucker. 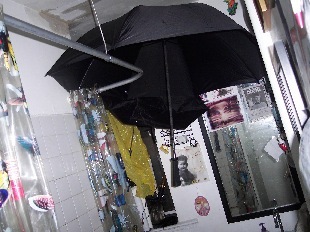 Unable to sleep, I waited around until all the water stopped dripping. Then I scoured the bathroom with Lysol, cleaned up all the "germs" as best I could and sat waiting for the ceiling to collapse, much as one might stand over a kettle of water waiting for it to boil, or, peer dully into the neck of an hourglass watching each grain of sand drip down so you would know when the end of eternity was a few grains away.In a toilet bowl, I couldn't go back to sleep. But I wondered--just how many toilets are there? It's hard to get an accurate handle on United States toilets because the sites I went into were locked down. To get info, you had to have a password. Still, I know there are some 100 million households in America, and odds are that there is at least one toilet in each. Sixty million are owner-occupied, so odds are they have at least two or more. That pushes us upwards of 200 million toilets. Now, there are buildings--offices, hotels, motels, McDonalds, Starbucks--for another 100 million potential toilets. Dollarwise, the paper and plastics division of the sanitary distributor system racked up nearly $9 billion in sales last year. The entire sanitary distributor system topped nearly $20 billion. In other words, there's an increase in wiping and flushing. But there's a ton of websites that focus on toilets for guys like me who walk around in the pre-dawn with an umbrella to keep the neighbor's toilet water from dripping on my head. One of them cites how many times a person flushes a toilet each day, and how much of our lives are spent on the "can." It seems we spend about 2,500 hours on the toilet during our lifetime, and make six to seven trips a day to its "throne." We forget how valuable a toilet is until we don't have one. There's also a website on an international basis. Seems there's a "world toilet watch" where you can report the status of toilets anywhere in the world, including pictures, for those who like to really plan their travel. There are other organizations that help you keep track of flushings and the history of toilets, including toilet paper. Seems a man named Scott developed the first toilet roll, but the innovation of the human mind was way ahead of the curve. Back in Roman times the rich used expensive linen attached to a stick to wipe themselves, and on a more crude side, sailors at sea prior to toilet paper used the hemp anchor line to remove waste from their bottoms. This morning I awoke to a bathroom free from drips. However, there is an odd smell lingering. Seems the plaster and wood absorbed the toilet water, so we are spraying the bathroom frequently and keeping the windows open to allow the flow of air to perhaps remove the tell-tale odor. There is, too, that lingering booby-trap danger. Like any terror-riddled nation, a bathroom that has been under toilet overflow attack may have dangerous munitions still armed. Above, hidden behind the ceiling, may be pockets of toilet water, and, god knows, other unmentionable items that may have slipped or slithered through the cracks and crevices of the neighbor's floors. I am prepared. I have my umbrellas at the ready. I have the Lysol poised. I have taken my Pledge of Toilet Vigilance. I have Courage over Toilet Fear, I have Conviction over Toilet Water Intimidation, and, I have the arms to take the Right Actions to protect future generations by spraying Lysol everywhere so I don't become Complacent and the let the Germs of Toilet Terror ooze into my thinking. So, the next time you are sitting on the toilet, look up! Remember, Terrorism can strike anytime, anywhere! Protect yourself. 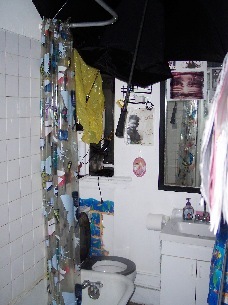 Go to the bathroom with an umbrella and the Pledge of Toilet Vigilance. Go To February 27 Story: "Softly Stalks The Beast Of Terror In Our Back Yards"